Deluxe is a free Bootstrap 4 HTML5 hotel resort website template. It is a mobile-ready, retina-ready and cross-browser compatible site canvas. Deluxe comprises tons of trendy and cutting-edge features, and assets like Hero header, sticky navigation, on scroll reveal animation, advanced search widget, modal video player and then some. 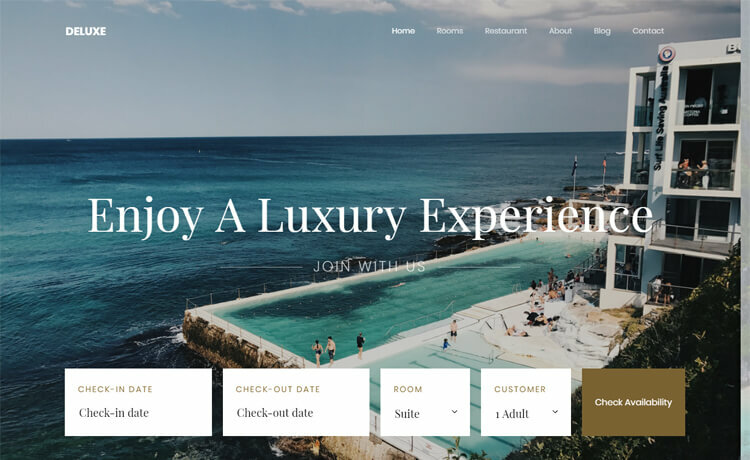 Deluxe is a free Bootstrap 4 HTML5 hotel resort website template. It is a beautiful theme for a hotel, resort or other kinds of accommodation business. Moreover, It is a responsive template with a clean, minimal and simple design with a multi-page layout. Deluxe brings a fantastic home page with rooms, restaurant, about, blog, and contact pages. Besides, it is a mobile-ready, retina-ready and cross-browser compatible site canvas. Deluxe comprises tons of trendy and cutting-edge features, and assets like Hero header, sticky navigation, on scroll reveal animation, advanced search widget, modal video player and then some. Intuitive and well-organized code structure makes it easy to customize the theme. Get your project rolling with Deluxe. Thank you for downloading Deluxe. Here are three recommended free Bootstrap 4 HTML5 hotel resort website templates for you.